While studying the embryology of the facial nerve, keep in mind the mature course and structure that is the end result of developmental events. The motor nucleus of the facial nerve is located in the reticular formation of the caudal pons. Upon leaving the motor nucleus, axons extend dorsally and medially, cranially and superficially, to bend around the abducens (sixth cranial nerve) nucleus. The fibers then exit the central nervous system (CNS) between the olive and the inferior cerebellar peduncle. The sensory root (nervus intermedius) consists of (1) central projections of neurons located in the geniculate ganglion (general somatic fibers that synapse in the spinal nucleus of the trigeminal nerve and special afferent fibers that synapse in the nucleus solitarius) and (2) axons of parasympathetic neurons from the superior salivatory (lacrimal) nucleus. The nervus intermedius enters the CNS lateral to the motor root at the pontocerebellar groove. After exiting the internal auditory canal, the facial nerve enters the middle ear, where it bends posteriorly (first, or medial, genu) and courses horizontally through the middle ear. Just anterior to the lateral aspect of the horizontal semicircular canal, the facial nerve curves gently (the second genu) to form the vertical, or mastoid, segment that exits via the stylomastoid foramen. The rostral division of the neural tube into its 3 main sections falls under the control of homeobox (Hox) family of genes. The Hox genes, well described as the master regulators of development, encode a set of transcription factors that specify the identity of particular segments during embryogenesis. The hindbrain is subsequently further segmented under the influence of Hox genes to give rise to rhombomeres, which are 8 transient neuroepithelial segments, denoted as r1 to r8. These sequential processes are referred to as anteroposterior (AP) patterning (this is distinct from ventral-dorsal patterning, which is discussed below). [4, 3] The rhombomeres r2 to r 6 are the most important for understanding facial nerve development, whereas r1 lacks branchiomotor nerves and develops into the cerebellum. The early segmental organization of the hindbrain has long-term effects on cell differentiation, in that each rhombomere gives rise to specific branchiomotor neurons, cranial ganglia, and pathways of neural crest cell migration. The rhombencephalon eventually divides into two main sections: the rostral metencephalon (pons and cerebellum) and the caudal myelencephalon (medulla). The facial nerve exists between these two structures at 40 days of development. Human facial nerve motor nuclei develop around the fourth week of embryogenesis from r4 and migrate caudally through r5 into r6, subsequently forming a loop or genu around the abducens (CN VI) somatomotor nucleus in r5. This explains the course of the facial nerve in relation to the abducens, as well as the combined fallout seen in Moebius syndrome. [7, 3] The general visceromotor neurons develop from r5 exclusively. Although the branchiomotor and visceromotor neurons of the facial nerve develop from the basal plate, they exit the brainstem dorsally from the alar plate. Both the visceromotor and branchiomotor cells bodies are located in their hindbrain nuclei; the sensory neuron (somatic and taste) cell bodies are located within the geniculate ganglion. After induction of its motor nuclei in the brain stem, the motor neuron must migrate from its nucleus to ultimately innervate specific facial muscles. This occurs in a 2-stage process that involves axonal growth from the basal plate towards its exit point, subsequent extension into the appropriate branchial arch, and cessation of migration once the designated muscle is met. With regards to the former, genes encoding repellant molecules play an important role in directing facial motor neuron axons away from the basal plate. These genes include netrins and semaphorins and encode chemorupulsive molecules. The possibility of chemoattractant molecules toward hindbrain exit points has also been postulated but as yet have not been identified. The control of motor neuron axonal growth into the periphery similarly depends on chemoattractant and chemorepellant mechanisms. Chemorepellants belong to the semaphorin family, whereas chemoattractant genes include ephrins, hepatic yet growth factor, brain derived growth factor, ciliary derived neurotrophic factor, and cardiotrophin. However, further discussion of the development of the facial nerve outside of the hindbrain requires a review of the neural crest (NC). Acquisition of directed migration to the dorsolateral pathway: This occurs via ErbB4, Eph/ephrin interactions, chemokines, and neuropili/semaphoring interactions. Homing to the branchial arches via segmental streams along the dorsolateral pathway: This occurs via guidance from chemokines, neuropilins, and their ligands. CXCR4/SDF-1 signaling is important in condensing and patterning the NC cells into the pharyngeal arches. Furthermore, semaphore-neuropilin interactions are necessary for the initiation of NC streams. Invasion of the branchial arch mesenchyme: This is a complex process and requires highly regulated, multiple guidance cues. Once again, neuropilins are involved in the signalling leading to the invasion of the branchial arches. Furthermore, VEGF has been shown to be a strong chemoattractive cue for NC cells into the second arch. Multiple other chemoattractive molecules have also been identified. Before 16 weeks' gestation, the otic capsule is cartilaginous and the developing perichondrium splits to envelop the facial nerve. This results in a cartilage base medially and a condensed mesenchymal covering on the lateral aspect of the nerve. The otic capsule develops from the otic placode, which invaginates to form the otic pit and, subsequently, the otic vesicle during the fourth week of gestation. At around the same time, the facial nerve canal develops as a sulcus running along the lateral aspect of the developing otic capsule. 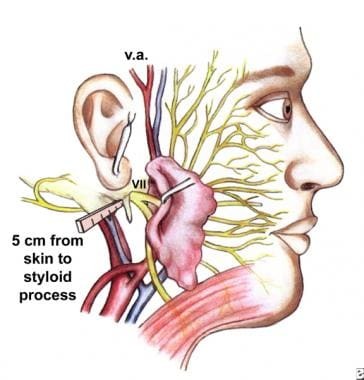 The common temporal origin of the stapes and facial nerve from the hyoid arch may explain the association between malformed stapes and facial nerve aberrations. The canal passes dorsally and caudally from the geniculate ganglion above the stapes and around the developing round window. The canal is, however, dehiscent from the labyrinthine to the end of the tympanic segment at this point. The development of the tympanic portion of the facial canal depends on a direct apposition between the developing facial nerve and the otic capsule, ultimately resulting in a mature position between the lateral semicircular canal and stapes foot plate. This dependence on direct contact with the optic capsule may explain why the tympanic segment is most prone to dehiscence and anomalous positioning. The initial path of the nerve distal to the geniculate ganglion is straight in early embryonic life but by the end of 8 weeks' gestation, the orientation of the facial nerve within the developing temporal bone has been established. The ultimate position of the canal and completeness of bony covering is determined by the concomitant development of the stapes and bony labyrinth. The mastoid segment of the facial canal develops postnatally as mastoid growth ensues, although the mastoid begins to develop from the surrounding mesenchyme from around 15 weeks' gestation. The stylomastoid foramen is, however, much more superficially located at birth than in the adult. During 11 weeks' gestation, branches develop from the facial nerve between the stapedius and the developing chorda. 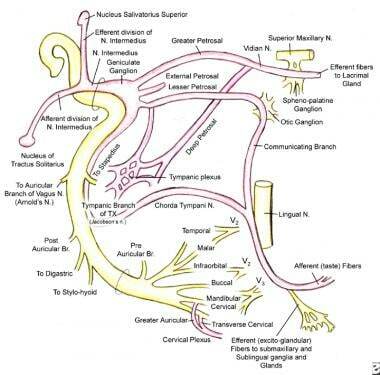 These branches join with branches of CN IX and X to supply sensation to the external auditory canal and auricle. The rhombencephalon (or hindbrain) is divided into the myelencephalon (caudal), which becomes the medulla oblongata, and the metencephalon (cranial), which becomes the pons and cerebellum. The facioacoustic (acousticofacial) primordium appears during the third week (4.2 mm crown-rump length [CRL]). It is attached to the metencephalon just cranial to the otic vesicle. The facial part of the acousticofacial primordium migrates cranial and ventral to end adjacent to the epibranchial placode, which is located on the dorsal and caudal aspect of the first branchial cleft. By the end of the fourth week of gestation (4.8-6.5 mm CRL), the facial nerve splits into 2 parts: the caudal and rostral trunks. The chorda tympani nerve exits rostrally and courses ventrally to the first pharyngeal pouch to enter the mandibular arch. Shortly thereafter, the nerve approaches the epibranchial placode, inducing the appearance of the large, dark nuclei of neuroblasts that represent the future geniculate ganglion. Mesenchymal concentrations that form the cephalic muscles are seen in association with their nerves, while the epibranchial placode disappears and the geniculate ganglion is identifiable. The greater superficial petrosal nerve (GSPN) is present. The chorda tympani nerve enters the mandibular arch and terminates just proximal to the submandibular ganglion, near a branch of the trigeminal nerve that will become the lingual nerve. The posterior auricular nerve appears near the chorda tympani. Complete separation of the facial and acoustic nerves is apparent, and a discrete nervus intermedius develops, making this an important temporal reference point for gestational disorders that affect both systems. The GSPN courses to the lateral aspect of the developing internal carotid artery (ICA), where it joins the deep petrosal nerve and continues as the nerve of the pterygoid canal. It terminates in a group of cells that will become the pterygopalatine ganglion. At this point, the most distal branches of the facial nerve are a loose network or interconnecting twigs. The nervus intermedius is now smaller than the motor root and enters the brainstem between the vestibulocochlear nerve and the motor root of the facial nerve. The chorda tympani and lingual nerve unite proximal to the submandibular gland. The posterior auricular nerve now divides into cranial and caudal branches. Several branches are visible in the peripheral portion of the seventh nerve. All of the peripheral branches lie deep to the myoblastic laminae that will form the facial muscles. At the end of the seventh week, the separations between the terminal branches continue to increase to the extent that all peripheral divisions can be identified. The parotid gland is beginning to develop from the parotid bud at this stage. The temporal, zygomatic, and upper buccal branches are superficial to the parotid primordium, while the lower buccal, mandibular, and cervical branches are deeper. Multiple facial muscles appear at this time as well, including the zygomaticus major and minor, depressor anguli oris, buccinators, and frontalis. A sulcus develops around the facial nerve that is the beginning of the fallopian canal. The orbicularis oris, levator anguli oris, and orbicularis oculi muscles appear. Auricularis anterior, corrugator supercilii, occipital and mandibular platysma, and levator labii superioris alaeque nasi muscles appear. All the cranial nerves more closely resemble their adult relationships. Extensive branching of the peripheral portions of the facial nerve occurs at this stage. Communication with the trigeminal nerve (via infraorbital, buccal, auriculotemporal, and mental branches) occurs in the perioral and infraorbital regions. The vertical portion of the facial nerve begins in the middle ear, and its overall relationship to external and middle ear structures is far more anterior than in the adult. Branches that will supply sensation to the external auditory canal arise between the stapedius and chorda tympani nerves. Intricate connections between the superficial and deep lobes of the parotid and their relation to the facial nerve develop. By the fifteenth week, the geniculate ganglion is fully developed, and the facial nerve's relationship to middle ear structures is more fully developed. All definitive communications of the facial nerve are established by the 16th week. At 26 weeks' gestation, ossification has progressed to partial closure of the previously formed sulcus into the fallopian canal. Abnormalities of the facial nerve may occur in conjunction with malformations of the ear, in isolation without associated anomalies, or in conjunction with a variety of syndromes that include abnormalities elsewhere in the body. In the newborn, the otolaryngologist evaluating a facial paresis or facial palsy must decide whether it is congenital or acquired. One in 2000 live births has a unilateral facial palsy, with a 90% spontaneous recovery rate. Approximately 75-80% of palsies in newborns are related to birth trauma. A history of forceps delivery, prolonged labor, ecchymosis over the mastoid, or hemotympanum raises suspicion for birth trauma. The presence of bilateral facial paralysis, other cranial nerve deficits, or other anomalies suggests a developmental etiology. Early, accurate diagnosis is important if the etiology is traumatic. In rare cases, surgery and facial nerve repair may be required in the newborn if the etiology is determined to be traumatic. The evaluation of facial nerve paralysis includes the use of electromyograms (EMGs), evoked electromyograms (EEMGs), and computed tomography (CT) scans. If the etiology is traumatic, the nerve can be stimulated for 3-5 days postnatal; fibrillation potentials on EMG develop 14-21 days after birth. If the cause is not traumatic, treatment generally is delayed. Eye protection is rarely required in congenital facial paralysis. In patients with congenital malformations, eliciting the fetal age at which development was arrested is usually possible. This allows for elucidation of the anatomy of the malformed structure based on its normal course of embryologic development. Furthermore, if anomalies are present in other organ systems (in particular, the kidney), they often reflect arrested development at the same time during development. In this way, the surgeon should be able to predict the location of the facial nerve, particularly in the case of middle ear malformation. In addition, many hereditary and congenital malformations are associated with abnormal facial nerve anatomy in the presence of normal nerve function. The otolaryngologist must be familiar with these conditions, because abnormal development may place the nerve at increased risk of injury during otologic surgery. An YS, Lee JH, Lee KS. Anomalous facial nerve in congenital stapes fixation. Otol Neurotol. 2014 Apr. 35 (4):662-6. [Medline]. Barkovich AJ, Millen KJ, Dobyns WB. A developmental and genetic classification for midbrain-hindbrain malformations. Brain. 2009 Dec. 132 (Pt 12):3199-230. [Medline]. ten Donkelaar HJ, Lammens M, Hori A. Mechanisms of development. Clinical neuroembryology development and developmental disorders of the human central nervous system. 2nd ed. London: Springer; 2014. 53-91. Trainor PA, Krumlauf R. Patterning the cranial neural crest: hindbrain segmentation and Hox gene plasticity. Nat Rev Neurosci. 2000 Nov. 1 (2):116-24. [Medline]. Lappin TR, Grier DG, Thompson A, Halliday HL. HOX genes: seductive science, mysterious mechanisms. Ulster Med J. 2006 Jan. 75 (1):23-31. [Medline]. Nieuwenhuys R. The structural, functional, and molecular organization of the brainstem. Front Neuroanat. 2011. 5:33. [Medline]. Chandrasekhar A. Turning heads: development of vertebrate branchiomotor neurons. Dev Dyn. 2004 Jan. 229 (1):143-61. [Medline]. Theveneau E, Mayor R. Neural crest delamination and migration: from epithelium-to-mesenchyme transition to collective cell migration. Dev Biol. 2012 Jun 1. 366 (1):34-54. [Medline]. Betters E, Liu Y, Kjaeldgaard A, Sundström E, García-Castro MI. Analysis of early human neural crest development. Dev Biol. 2010 Aug 15. 344 (2):578-92. [Medline]. Barlow LA. Cranial nerve development: placodal neurons ride the crest. Curr Biol. 2002 Mar 5. 12 (5):R171-3. [Medline]. Kulesa PM, Bailey CM, Kasemeier-Kulesa JC, McLennan R. Cranial neural crest migration: new rules for an old road. Dev Biol. 2010 Aug 15. 344 (2):543-54. [Medline]. Mortazavi MM, Latif B, Verma K, Adeeb N, Deep A, Griessenauer CJ, et al. The fallopian canal: a comprehensive review and proposal of a new classification. Childs Nerv Syst. 2014 Mar. 30 (3):387-95. [Medline]. Tóth M, Sirirattanapan J, Mann W. Patterns of anomalies of structures of the middle ear and the facial nerve as revealed in newborn temporal bones. Otol Neurotol. 2013 Aug. 34 (6):1121-6. [Medline]. Sataloff RT, Sataloff JB. Embryology & Anomalies of the Facial Nerve and Their Surgical Implications. 2nd. Jaypee Brothers Medical Pub; July 2014.